My name is Sebastian Nigro. Just remember me as Seabass. I've been working with Game Maker for well over 12 years now. Some of my hobbies include making video games, writing these blog posts, and sleeping. When I started working on this project in the beginning of 2014 I wasn't sure exactly what I wanted. I knew it needed to be an open-world sandbox game but didn't really have a clear vision of my game just yet. After a few months I scrapped the work I had done and started over. This time with more clarity and calm, I began working on my second iteration of the game. The game had a unique 2.5D style to it and some quirky art style that I regret to say I created. I'd describe the game as a "generic open-world sandbox survival with some extra passion mixed in". Despite the opinions and worries of my fellow developers I managed to actually greenlight my game. The game was actually very positively received. 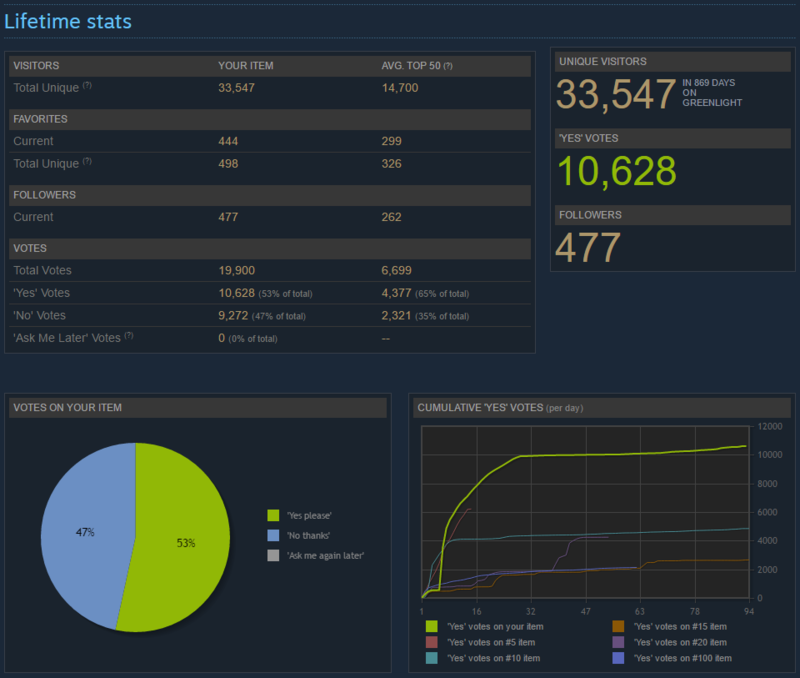 Most games on greenlight don't even get a 50% split on yes to no votes. This was a good sign and meant that my idea wasn't complete rubbish. I spent three months stressing out and fearing the worst (that the game would never be accepted) before it was greenlit. Once greenlit I rushed out a public build over the course of a few days. This was my biggest mistake. I promised users multiplayer and so many other features that I was ill prepared to deliver. Luckily the game still sold decently for a game with little to no marketing. As a one man team this wasn't a complete bust. I had earned (after taxes and splits) around $2,450. This is by no means a failure. I had been working a full-time job on the side as well so this wasn't a bust for me financially. Throughout the three months following the games release I made sure to give my users as many updates as possible. I worked day and night pumping out new features and items. At one point the game even got a visual makeover thanks to an artist I brought on board. What I learned from this is that users will continue to purchase and support a product well into its life time if you share your passion for the project with them. I reply to nearly every post (95% probably) and take user feedback into account with every decision I make. This has created a very positive and unique experience for my users. I want to show my journey from start to finish. I'm currently recreating the game from scratch once more and this time including multiplayer from the start. I have the resources and time to pursue giving this project one last try. I have not seen anything created professional in Game Maker that has the same goals in mind and I'm starting to see why. It is a huge process and some parts very interesting to solve. I'll be sharing my experience on a regular basis through a series of posts here. If you are interested in checking out some networking code and concepts, proper rendering, or anything else software development related, I recommend bookmarking this page.